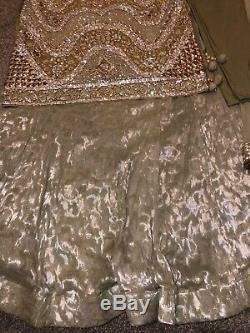 Size 14-16 Pakistani Designer Elan inspired bridal/formal in a gorgeous Pistachio Green. 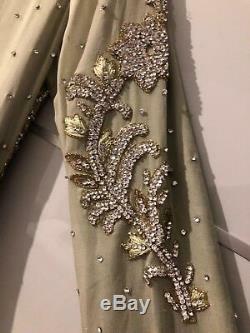 This is a 4 piece outfit comprising of a fully embroidered chiffon Kameez with heavy stonework and mirror detail (both front & back), a shimmering self print lengha, chiffon dupatta and plain trousers. 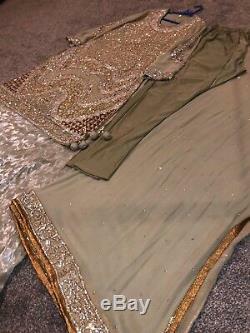 You have option to wear with lengha, or can wear with trousers for a less formal look. So in effect, two looks for the price of one! This is an absolutely stunning outfit. Photos simply do not do justice to this item!!! This item really shimmers when catches the light. Item is a beautiful pistachio green colour, however in darker light gives an almost grey look, I think this is due to the mirrors and the shimmering effect! From brand new, Ive only worn this outfit on one occasion between 2-3 hours before another outfit change for a close family wedding. The trousers have never been worn. So grab yourself a bargain. Only reason for sale is that I dont have another party/function coming up. 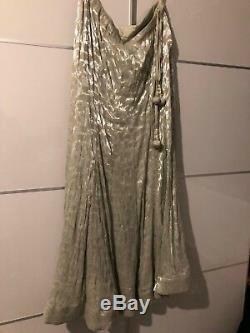 This item is a beautiful formal piece and Id rather someone get use from it than just hang in my wardrobe. This will look amazing, you are sure to get lots of compliments, like I did! Please note, this item is extremely heavy due to mirrors and stonework. There may be the odd stone missing. 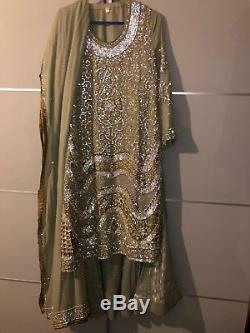 Not noticeable when worn, as there are simply hundreds of stones on this outfit! Size 14 -16 to fit Med-Large. Please check your measurements against those below. All my items for sale come from a clean, smoke and pet free home. At this price, for how exquisite this item is... You are truly getting a bargain. 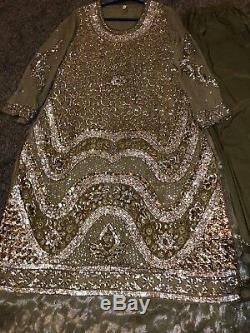 The item "Size 14-16 M/L Pakistani/Indian Designer Elan Salwar Kameez Lengha Wedding" is in sale since Sunday, November 4, 2018. 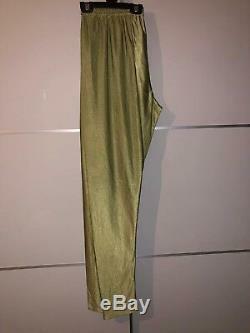 This item is in the category "Clothes, Shoes & Accessories\World & Traditional Clothing\Other Traditional Clothing". 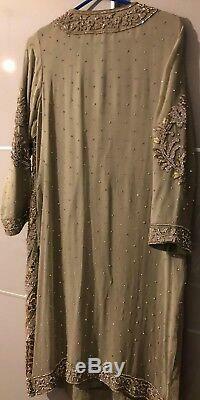 The seller is "thumbsup786" and is located in Wolverhampton, West Midlands. This item can be shipped to United Kingdom, Antigua and barbuda, Austria, Belgium, Bulgaria, Croatia, Cyprus, Czech republic, Denmark, Estonia, Finland, France, Germany, Greece, Hungary, Ireland, Italy, Latvia, Lithuania, Luxembourg, Malta, Netherlands, Poland, Portugal, Romania, Slovakia, Slovenia, Spain, Sweden, Australia, United States, Canada, Japan, New Zealand, China, Israel, Hong Kong, Norway, Indonesia, Malaysia, Mexico, Singapore, South Korea, Switzerland, Taiwan, Thailand, Bangladesh, Belize, Bermuda, Bolivia, Barbados, Brunei darussalam, Cayman islands, Dominica, Egypt, Guernsey, Gibraltar, Guadeloupe, Grenada, French guiana, Iceland, Jersey, Jordan, Cambodia, Saint kitts and nevis, Saint lucia, Liechtenstein, Sri lanka, Macao, Monaco, Maldives, Montserrat, Martinique, Nicaragua, Oman, Pakistan, Paraguay, Reunion, Turks and caicos islands, Aruba, Saudi arabia, United arab emirates, Ukraine.